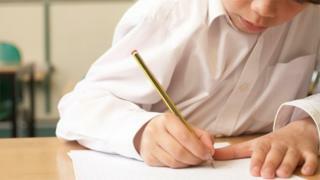 Councillors in Dorset are calling for a change in the law to allow officers to check on home-educated children. A county council safeguarding committee heard 40% of parents of such children were not engaging with the authority. Virtual school team head David Alderson described keeping track of the 454 children taught outside the school system as an "interesting" task, the Local Democracy Reporting Service said. Currently officers can only intervene if there are safeguarding concerns. The committee heard the team of one full-time and four part-time advisers overseeing homeschooling had a budget of £20,000 and no powers to inspect the quality of education being offered. Mr Alderson told the meeting: "The best way is to engage with the parents and carers and offer support wherever it is possible. "We cannot enter a home without express permission but we have got around 60% of parents engaging with us." Councillor Bill Pipe described rules that exclude officers from checking on pupils as "a stupid piece of legislation". "We should lobby for the provision of the Act to be changed," he said. School exclusion officer Sylvie Lord said the number of home-educated children, nationally, had gone up by 200% in the last three years and children were often "persuaded" out because they were threatened with exclusion or because parents were unhappy with what was being offered.